Meanwhile, right next door to the incoming ramen restaurant ... the signage is up for the new tenant — Thai Direct. Our Thai bowls are healthy versions of famous street Thai dishes using our own Thai sauces made with authentic, natural, and non GMO ingredients with no MSG and no or minimal amount of sugar added. Our Thai sauces are gluten and dairy free. 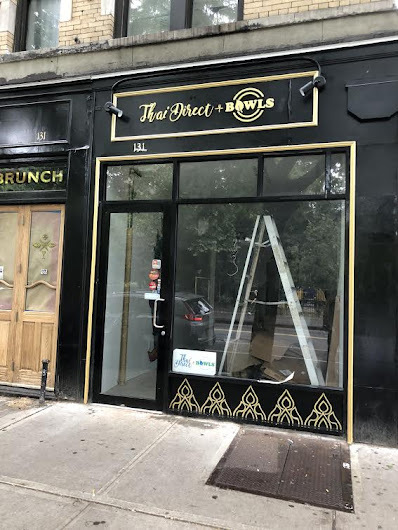 Thai Direct debuted in early 2017 in Brooklyn, serving Bedford-Stuyvesant, Williamsburg, Greenpoint and Bushwick, according to this article via DNAinfo. This long-empty storefront was last Yoshi Sushi until late 2015.